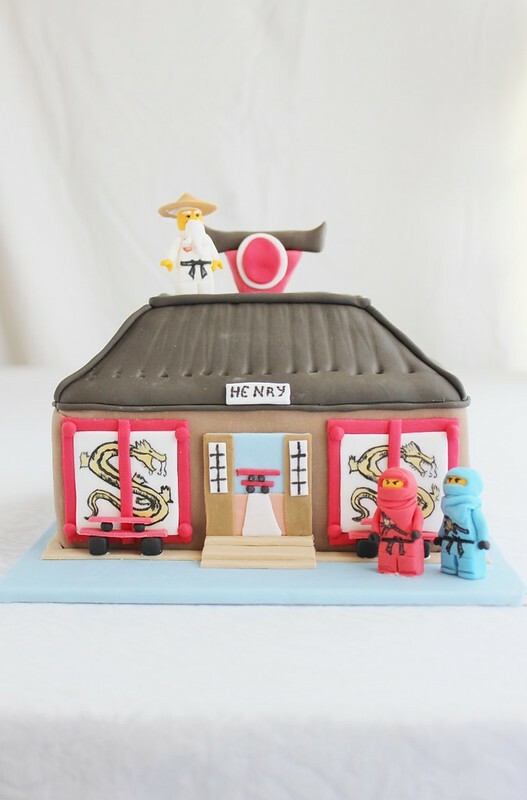 A little while ago I was asked to make a cake for a young boy who loved "Ninjago" and just like Adventure Time and Bubble Guppies I really had no idea what this new craze was, once again I felt a little out of the loop... and very old. 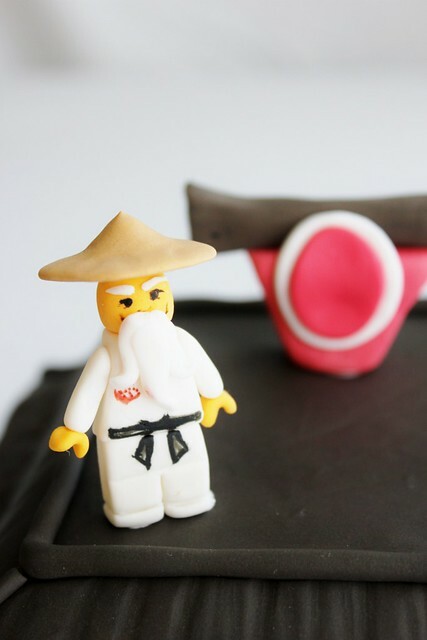 Turns out Ninjago is a Lego TV show, so like, little Lego men come to life on TV. If you would have told me this when I was five and playing with Lego I would've thought you crazy...but also pretty cool. Technology these days huh! The first request for the cake was actually for the "Destiny's Bounty" boat. Which was, lets say, a little out of my league. Maybe Ace of Cakes could tackle that one? 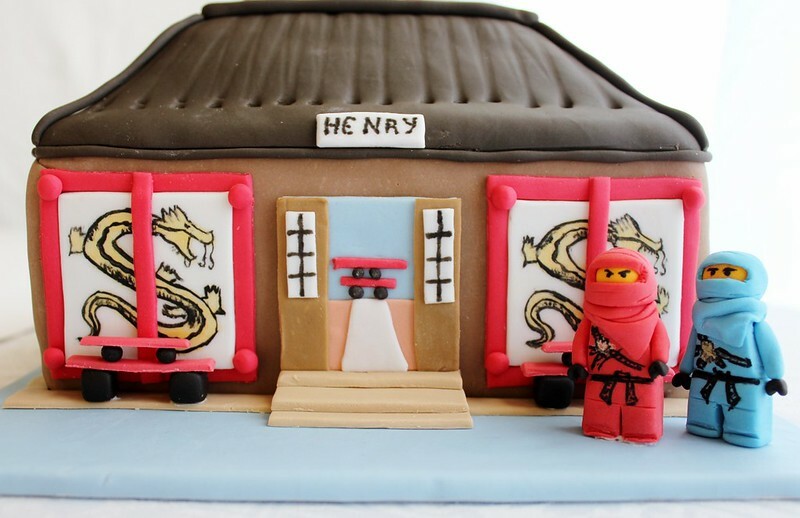 Then the design was up to me, all I had to go on was one tier, Ninjago themed and chocolate. So I did my research and decided to make the "Dojo" which is (I think) the house thing where these four ninja dudes meet up or live or something. Oh and they fly on dragons, did I mention that? Cos that's normal, ya' know. I always find it tricky to make single tiered cakes because you can't do quite as much as you could with two or three tiers. I decided that in order to create the upstairs and the roof I would just have to use fondant and shape the cake a little. 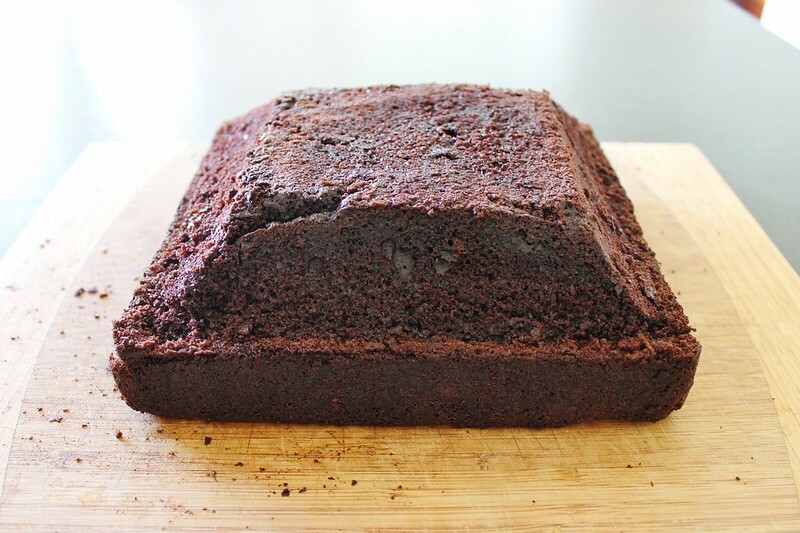 I made a double batch of my chocolate cake in square tins, then cut the top of the cake on an angle upwards to create the roof. 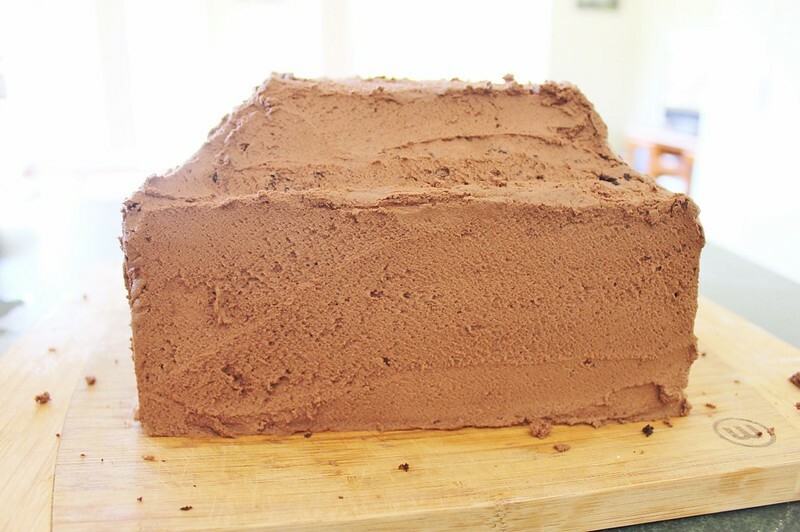 Once the roof was sculpted I covered the entire cake with chocolate buttercream then with light brown fondant. I covered the roof in chocolate fondant and indented the sides with a chop stick. 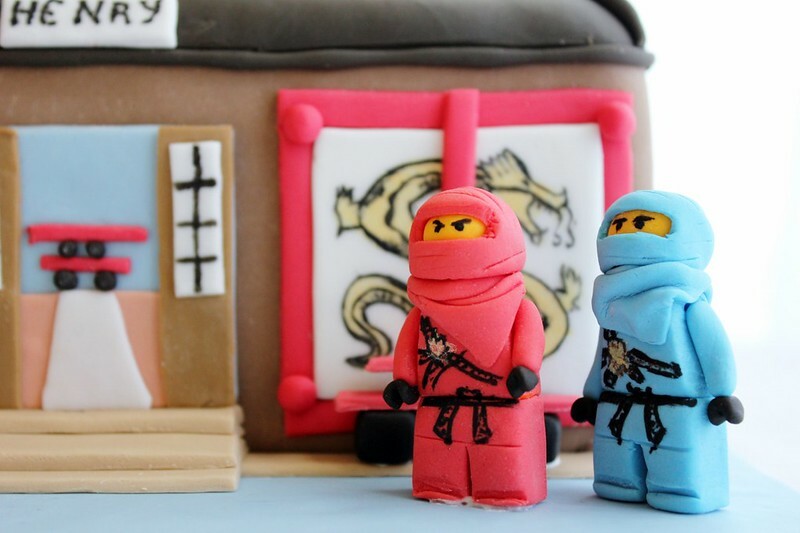 The walls were a little more tricky, after doing tonnes of research on the "Dojo" and other cakes I decided I just had to paint gold dragons on the walls. 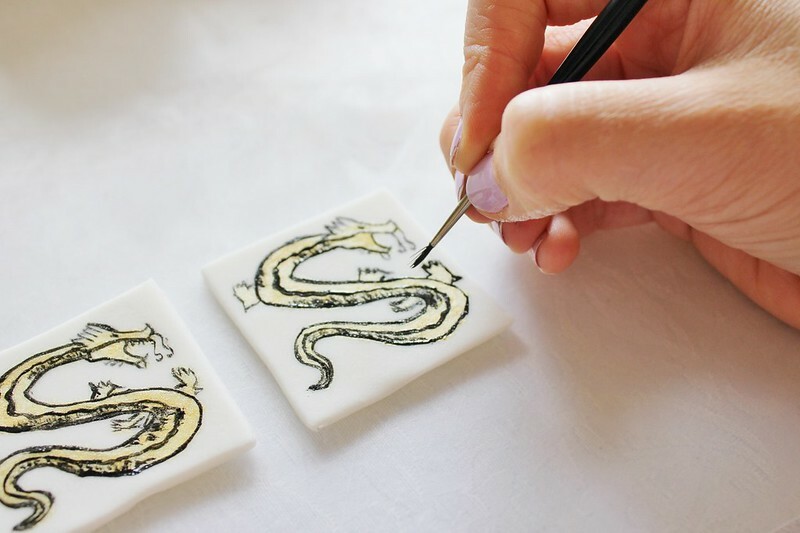 I used gold lustre dust mixed with a tiny amount of vodka to paint the dragons, then outlined the whole thing with black gel colouring and a teeny tiny (food safe) paint brush, lots of work but totally worth it! I also tried to make a window in the middle (not sure it looks that way) with lots of layers of finicky fondant details. Have I mentioned I love doing detail work? Then came the fun part, making the Lego men! After finding out the birthday boy's favourite characters I printed out photos of each of them in the same scale size I wanted to make. I mixed a 50/50 combination of fondant and gumpaste and pressed each of the pieces of fondant onto the printed out photos so I got the proportions exactly right. I painted the details on each of the characters. I think my favourite would have to be Sensei Wu, the little Asian man (who has a suspiciously American accent on the show). So there we have it, one of my favourite cakes I've made so far. 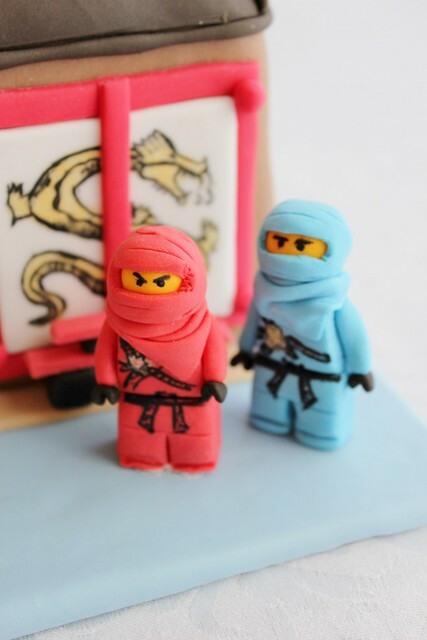 I had fun making it, learnt a lot about Ninja Lego men and best of all the birthday boy loved it! An awesome cake Lydia, I love that you designed it as well. The Lego men look wicked! Lydia this is absolutely fantastic. What a terrific job.